After the slight disappointment of the Constable I went wandering around the V&A. I only did a few rooms, any more than that and the brain shuts down! I found myself in the medieval galleries, cases full of the most exquisite metalworking and ivory carving. They are a wonder to see with untold hours of human life gone into their making. There was a Bishop’s crozier that could well have taken a whole year or more of labour. It occurred to me that making treasure was an important part of the artists remit. Not just an object that has value to those that know, but an object it is hard to imagine anyone leaving in the skip should they spot it there. I am quite fond of the skip definition of visual art. If you chucked it in a skip would anyone who looked in rescue it? If they wouldn’t then it probably ain’t art! Mt R Mutt’s urinal might well be filched but only for its plumbing possibilities! Artists have in recent years seem to have largely avoided the treasure aspect. With a true object of desire all the desirability is bound up in the object itself it does not need any history attached. I realise that solid gold objects or diamond encrusted skulls will be whipped out of the skip tout de suite, but so would bundles of used twenties! Some of the objects in the V&A are just there because of their historical interest but by far the most are there because of the intrinsic beauty of the object. Most are unattributed so whether the maker had an ear truncation moment in his or her past or not is plainly irrelevant. The other thing that struck me was that size was an issue. Treasure in an uncertain world seemed to need to be portable. Though there are large things for the most part they fit into a display case. This would explain those buried classical statues, just too big to carry off. So, how to imbue you efforts with the treasure quality and make them worth a passer by swiping from our skip? The object need not be made of intrinsically valuable stuff, so I will exclude such objects as they muddy the water. So perhaps just a painting in a cheap damaged frame. I doubt many mass produced prints would be rescued, but what I really want to know is will one of my paintings be spared the landfill. I suppose it would be easy to test and I am quite tempted to try. Sticking for the moment to theory. To my eye unifying quality creating the desirability of the items in the V&A is that they display expressed human skill and more than that the joy in expressing that skill. An object of utility might well express skill but a useful and beautified object revels in it. This is plainly in large part why they survived, generation after generation have found something pleasing about these objects and preserved them. Many of course as an expression of portable wealth, but that wealth value is caused by the object being pleasing and thus desirable. This is why I think the skip definition works so well. Today we look to an object’s location and presentation to judge value. You might put a bit of paper with numbers over it in a dustbin and no one will look at it twice. Put that same bit of paper in a safe and it would be viewed differently. The same occurs with current art objects. Put them in the Tate Modern or a swish penthouse flat and we quickly assess them to be Art and hence of value and consideration. Scatter the contents of the Tate Modern that had no intrinsic material value into skips around the capital and I wonder how many would be still there next day? I bet if you scattered the V&A contents in the same way they would have a far larger survival rate. So when you look at at a heap of bricks on a gallery floor and have that art feeling you are not being clever and sophisticated, you are being pleasantly deluded about both the art and the quality of your own discernment. On the other hand when you pass by a skip and spot a beautifully carved panel in an old and broken wooden chest half covered with bricks and take it home to keep and admire then you are having a true aesthetic moment. If you leave the carving in the skip and take the bricks home and arrange them on the floor you are plainly an idiot! There is of course the unlikely scenario where you spot a nice bit of carving outside a posh house and just as you were about to take it home notice that the name on the brass plate by the door is C, Andre. You would then of course take the bricks home in triumph and call the auction house. This however is love of money not art! Of course the treasure aspect is not the only factor. Most of my paintings are experienced for free by people on line. By the feed back some have a pleasing experience when looking at them. Value or treasure does not come into it. This is, I freely admit, a circle that is hard to square. If I do not sell the pictures then I am just supplying free entertainment to others. Either as an act of generosity, need for attention, hope of future gain or most likely a mix of all. This is partly why I am going to try to exhibit more, and the first toe in the water is on this month when I am exhibiting with my friend Graham Davies for a couple of weeks. The details are below! PS be sure to check any skips in the area… you never know! 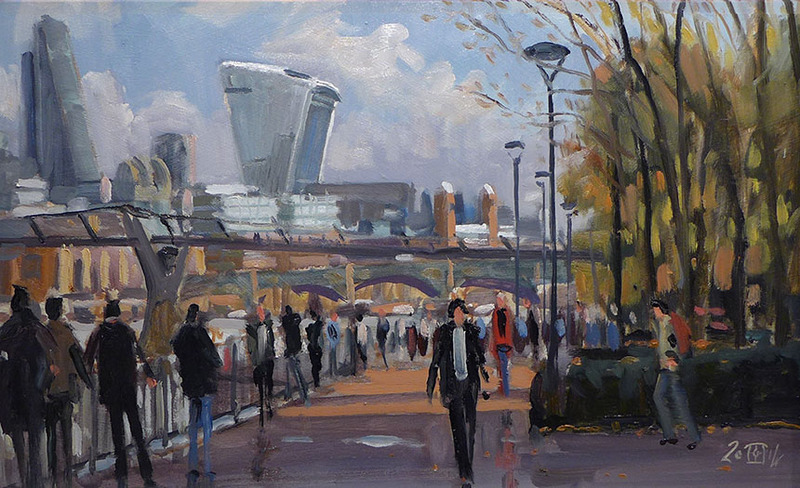 I am showing 20 or so London paintings mostly local to the area where I live. 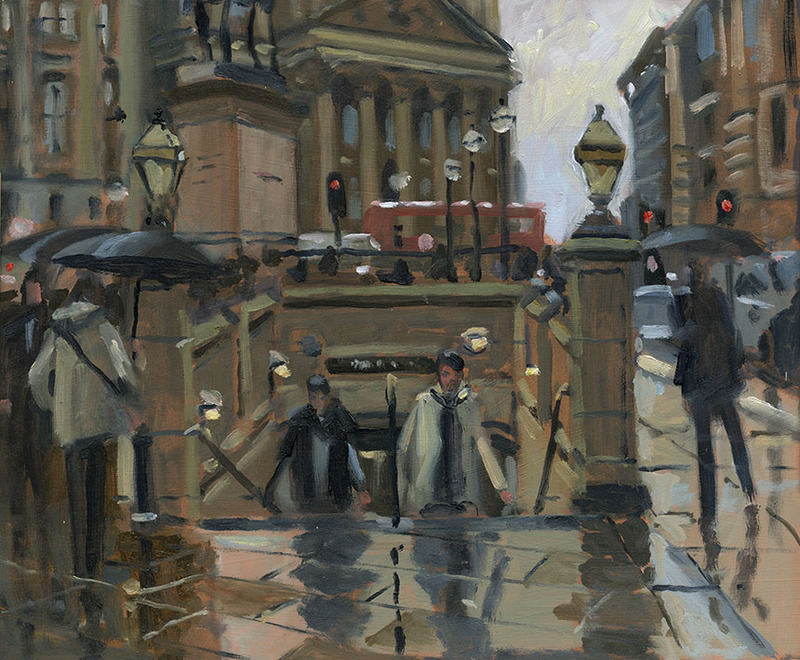 There that’s the promotion done now for recent paintings! This is a moment I definitely could not have captured en plein air! We are looking West up the Strand. As I waited to cross the road a seemingly endless parade of holiday cyclists passed before me. It look oddly joyful and I snapped away like mad to try to catch the moment. As is often the case the photos looked very disappointing once looked at at home. If I just came across them a year from now I would hardly have set out on a big painting based on them. However I wanted to attempt to recapture some of the moment as I recalled it so this is my attempt. I’ll put my reference photo below so you can see what I have kept and what I have changed. 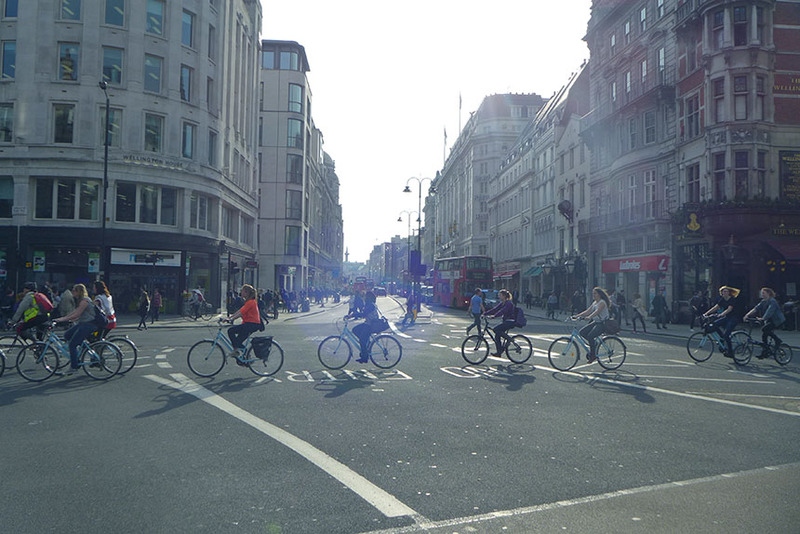 I took several sets of cyclists and rearranged them to set the mood. The shape is a triple square which I hadn’t deliberately tried before. 12in by 36in oils. I have since toned down the blue T shirt! It was the wonderful shadows as much as anything that attracted me. Now for something different. I was due to paint with the Brass Monkeys in London so in order to find out how it was to go up to London and back in the day I set off to Gillingham Station. I had left home early intending to take photos of the morning which was gorgeous with sun and slowly clearing morning mist. Near Shroton on my way I saw this and could not resist. I got everything in bar the sheep who only had their shadows present. Time had passed and I came within a few minutes of missing my train. 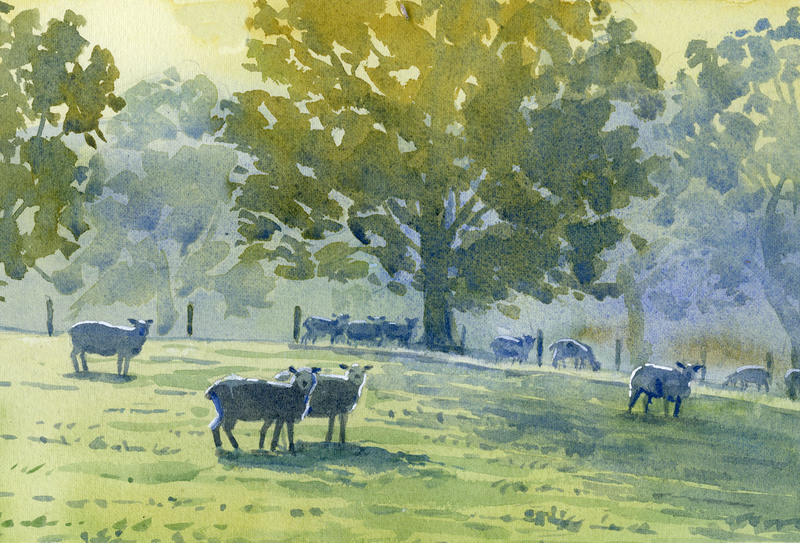 The picture had to wait a week before the sheep were reunited with their shadows! 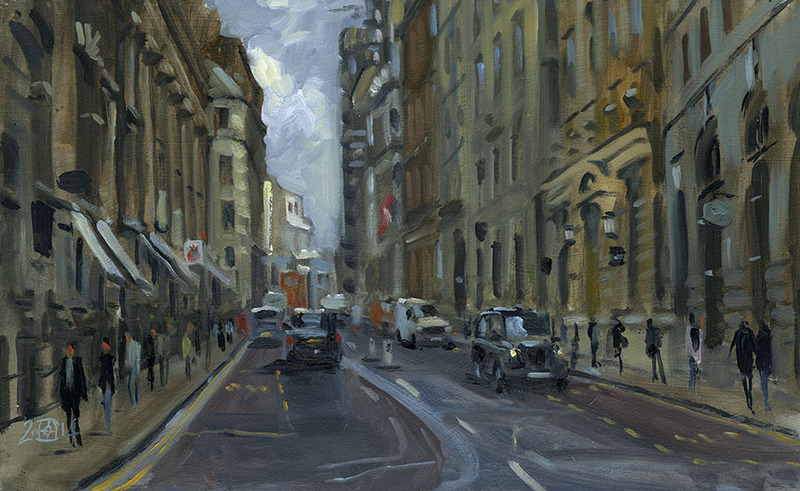 In order to promote and exhibition for the United Society of Artists at Bankside I painted with Michael Richardson at the Royal Exchange. It was a wet day but I love London in that sort of weather. This is the Bank tube entrance. 10in by 12in Oils. 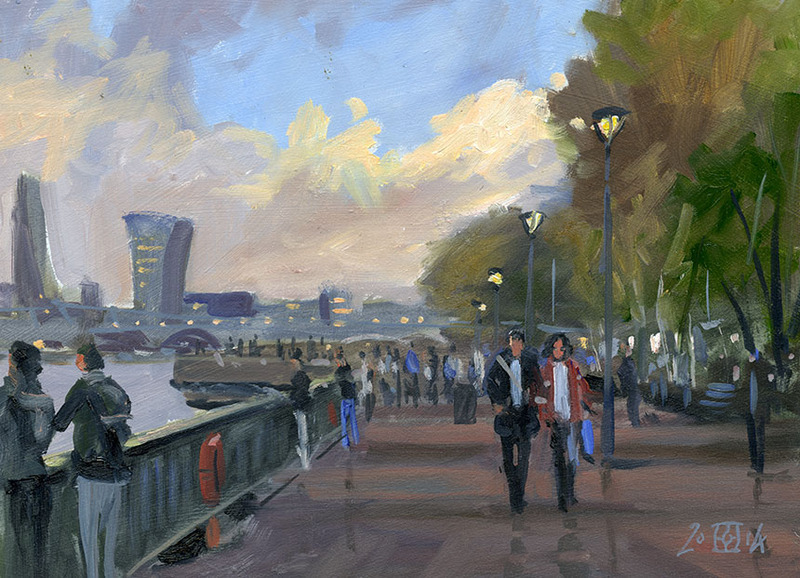 The day of the private view I painted outside the gallery. In tried again not to define too much, not really a finished painting but it catches a little of the feel of the day. 10in by 16in oils. I then did this very fast 20 min sketch as the light faded. 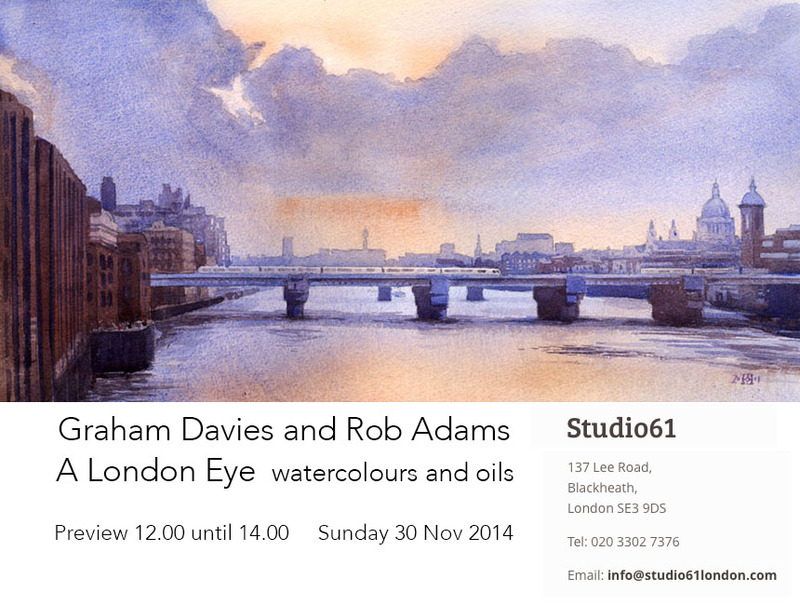 Our efforts were hung on a “wet wall” in the main show which seemed to garner some interest but no sales! 10in by 12in but cropped here. Oils. 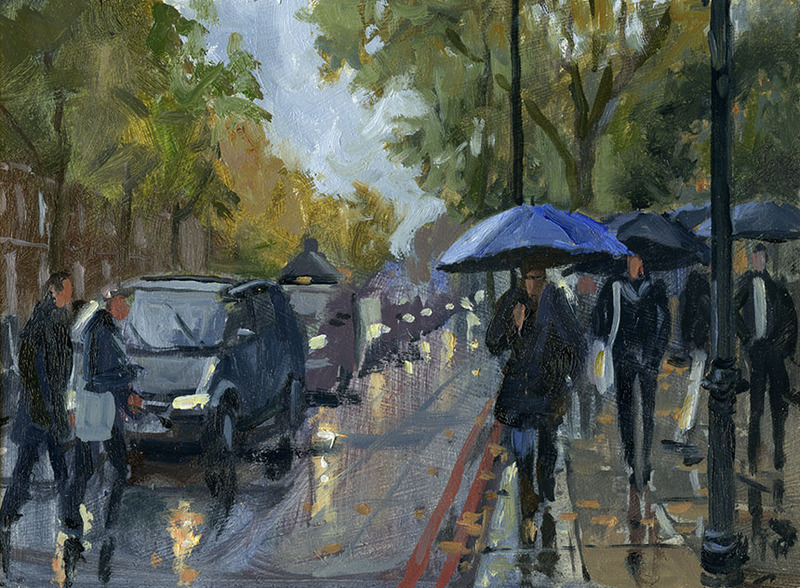 The next Brass Monkey day was on an extravagently wet day in Knightsbridge. The Met office forecast the previous day was covered in yellow warning triangles so I came prepared! 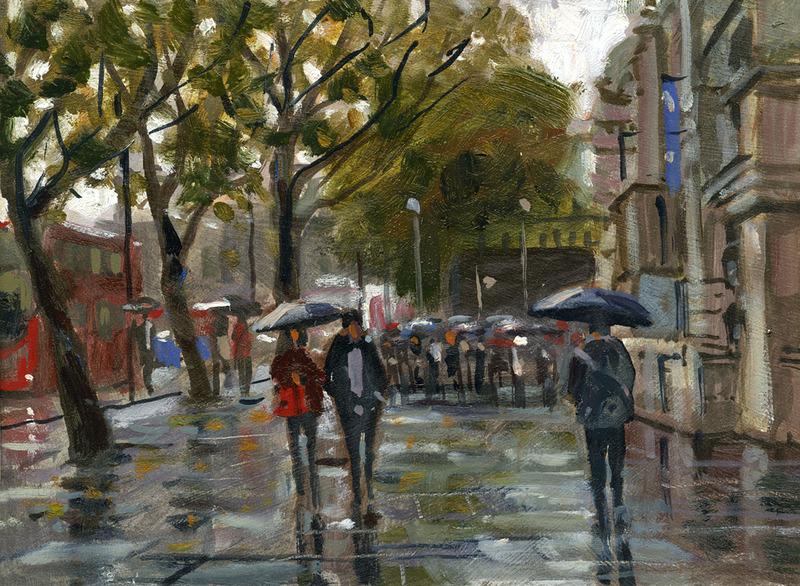 I only took my tiny 5in by 7in Pochade and painted with my umbrella handle stuffed down one trouser pocket and gripped under my painting arm. With the other hand holding the pochade I had plenty to contend with and was glad the panels were only 5 by 7! This is just outside the V&A. The tones and reflections were absolutely gorgeous. After having visited the Constable show I painted this which was so much fun, I loved the puddle in the foreground. Each of these took about twenty minutes as my arms started cramping from the effort of holding everything. 5in by 7in oils. This was only the drawing out and a few establishing turpsy washes when the cramps hit again and I had to stop. Once home I felt it was worth finishing. 5in by 7in oils. A month or so ago I had bought some cheap clip on lights for reading in bed. I clipped one to illuminate my palette and held the other. I haven’t done a nocturne in a while so this was great fun. 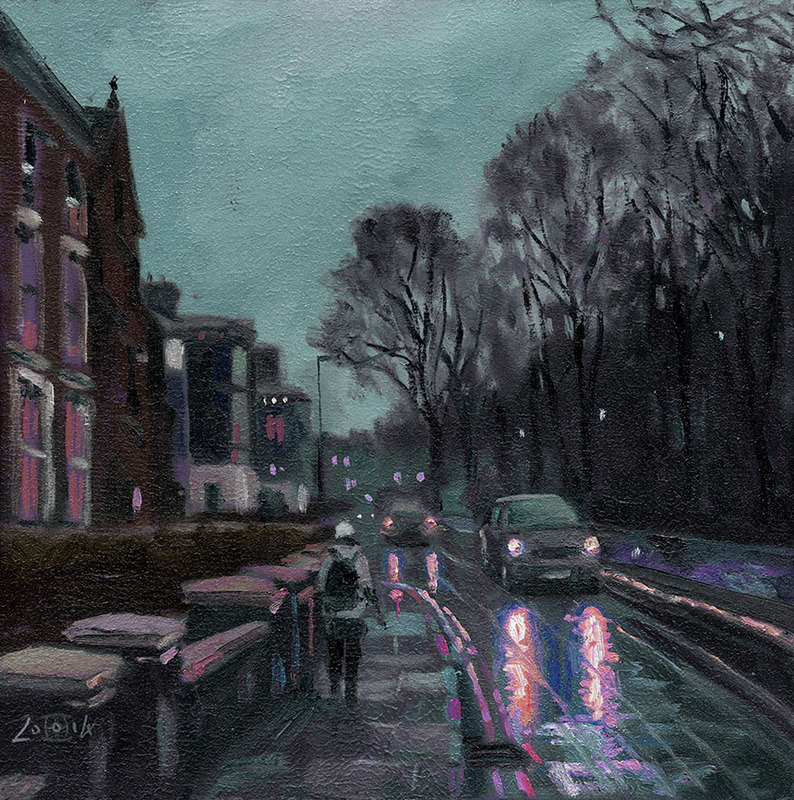 The rain kindly let up while I painted which made life easier. One of the great things with city nocturnes is that the light is not going to change so I spent well over two hours on this. I had the usual thing with colour though, despite trying to predict the change I was still surprised when I got it home and looked at it in decent light. Above is how it actually looked at home below is how I imagined it might look. Only a very rough Photoshop adjustment but it gives an idea! Hopefully some landscapes of Dorset in the next instalment. 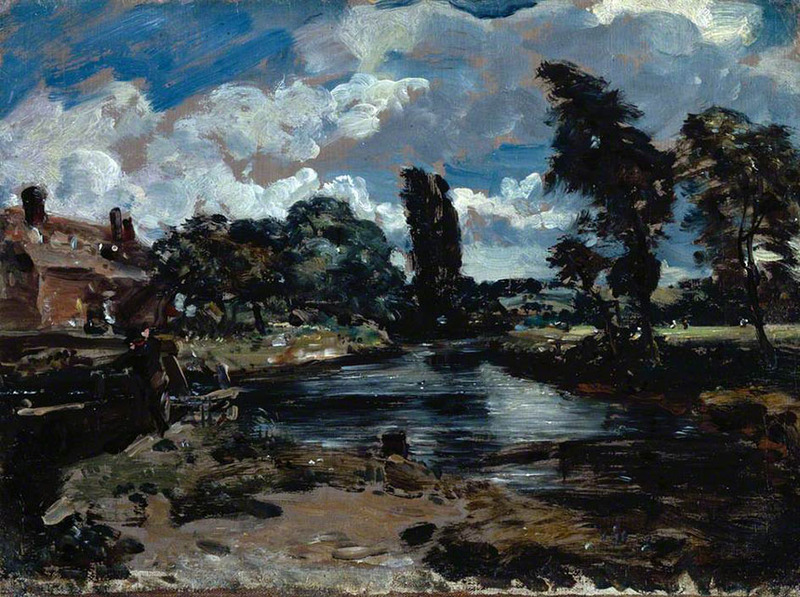 I went to see the Constable exhibition at the V&A. 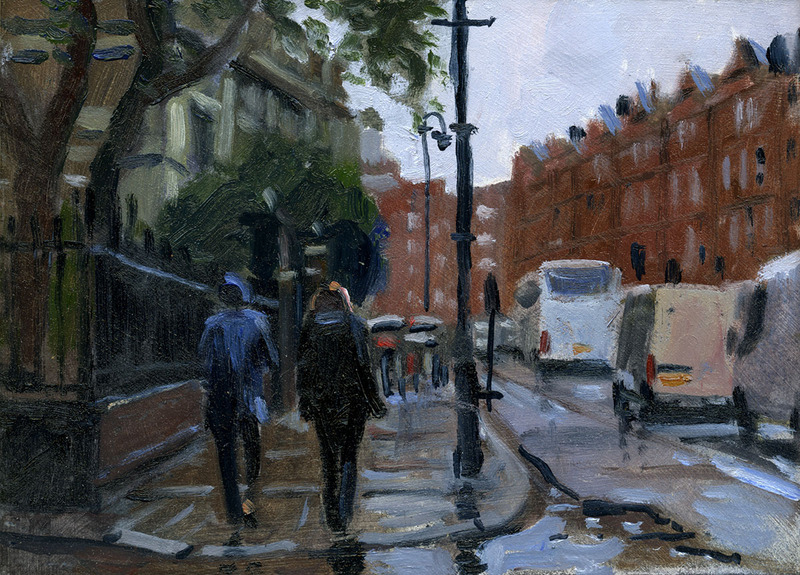 I was painting in a very wet Knightsbridge and took refuge from the rain for an hour or so. I nowadays try to distance myself from all I know and have heard of an artist when I look at their pictures. What would the reaction be, I try to think, if an unknown posted this on an online painting forum… how many “likes” would it garner. 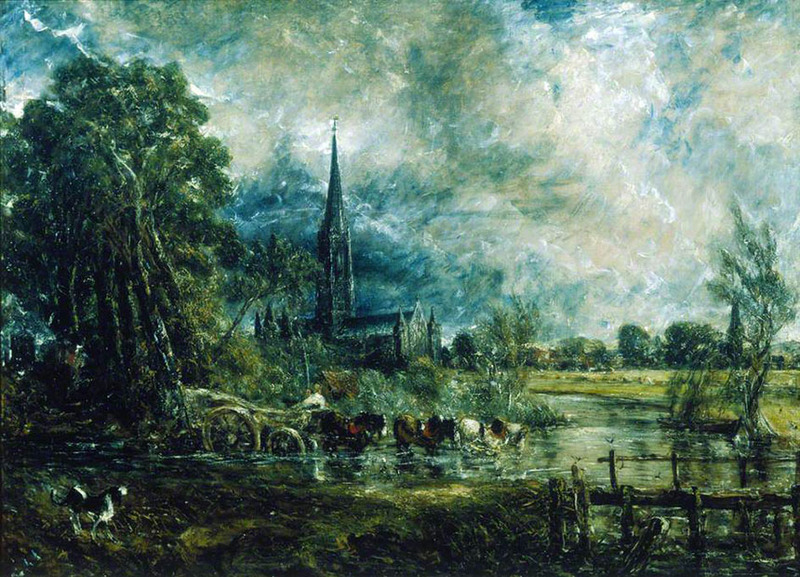 It is not easy to look afresh, this is after all Constable, one of the greats of British landscape. The exhibition is well worth seeing as it includes paintings by artists who influenced him, both from the past and his contemporaries. So we had Thomas Girtin who he admired hugely and Ruisdael who he copied with great attention to detail. The exhibition also included the sketches and so forth where they when available, which I always like because they show how an artist sets about his business. Firstly there was much I very much liked. The small plain air sketches and pencil studies. One or two of which have a lovely immediacy and delicate touch. It was here that the heretical thought occurred… if I found an unknown one of these and posted it under an assumed name on UKPleinair (a Facebook group with many fine painters as members) would it stand out? After racking my brains I had to conclude most would not. Indeed many were well below the standard that some artists currently post. The very best would I expect garner praise and positive feedback of course but not I have to conclude adulation. A few examples would be appropriate I suppose. Here is a middling quality painting. You have to say though perfectly pleasant it is ordinary. 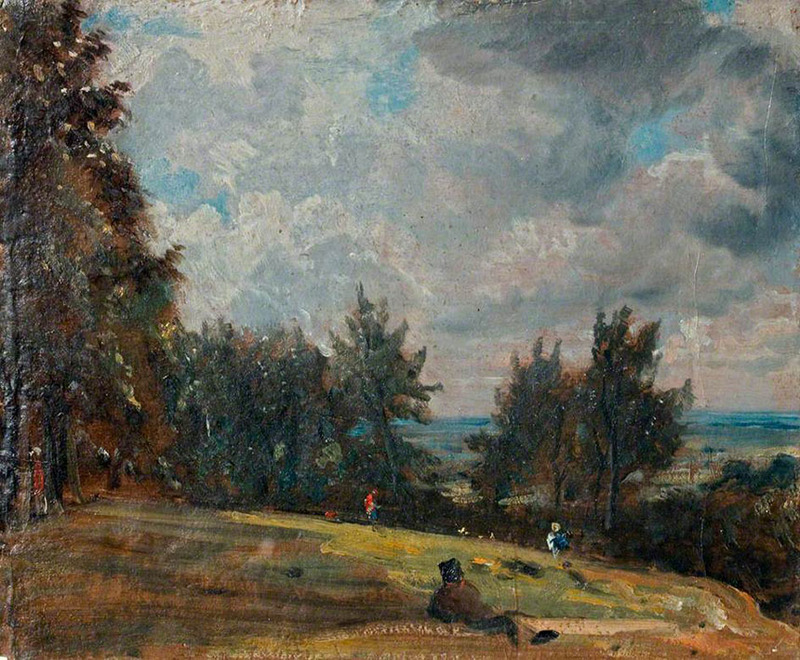 Other painters of the time such as Turner and Girtin were doing far better work on the average in my opinion. Here is another from later in life. Some nice enough bits but the trees to the left are clumsy as is the composition. The distant blue is a good touch but once again nothing remarkable. Here is another, very briskly painted but heavy handed with some ugly brushwork. 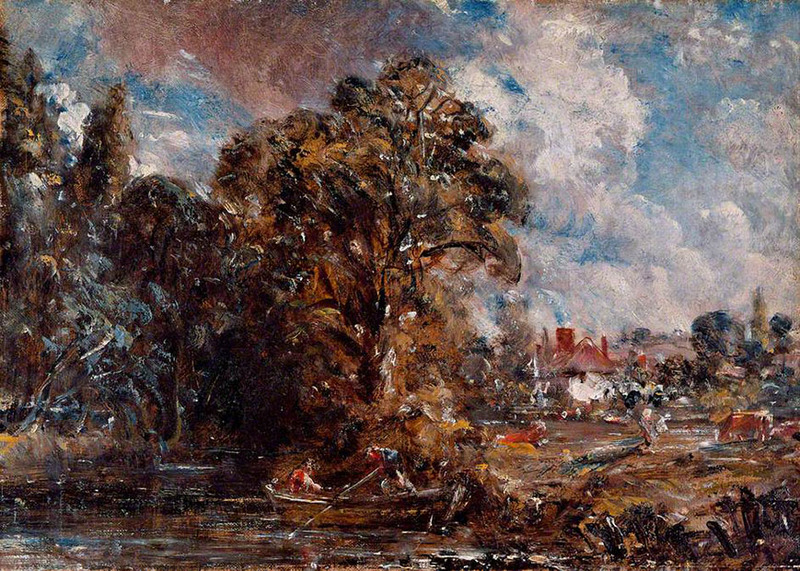 If it was not by Constable you would possibly throw it out! 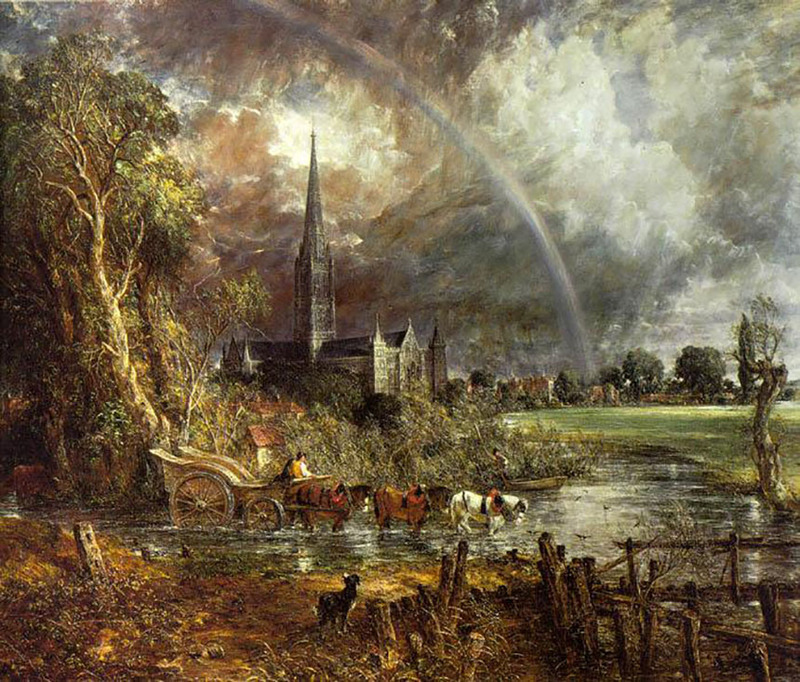 Because it is by Constable we earnestly peruse it, but to my eye it is just a poor painting. This is a sketch for a bigger picture. I find, as Turner and the other Academicians did, that the crude muddy brushwork and the shotgun white highlights just don’t work. The red browns also overwhelm the painting and sit unpleasantly with the blue. Now to dig myself a deeper hole still I will consider one of his iconic later paintings. Here is the sketch. There is very little good here. The drawing is poor with Salisbury cathedral toppling to the left. As for the stand of trees on the left, what was he thinking? The sky usually one of his stronger points also is marred by ugly fussy and ill considered white highlights. Here is the final result. It looks better here than in the flesh. The whole picture is smothered in distracting white speckles. He used to call this his “snow” and knew that other painters disliked it. The drawing is a little improved but the river on the right climbs impossibly up the picture plane and there appears to be a miniature village built into the undergrowth on the far bank. Once again the trees are terrible especially the overworked branches at then top. Is it just me but those horses look more like Shetland ponies rather than cart horses! Poor Constable I hate to say it but I think he has been built up greater than he really was. It is not his fault of course he has been taken by art historians to represent the precursor of impressionism. He is in fact, I feel, a very hit or miss painter who struck a few very high points here and there but struggled in later life to find his way. 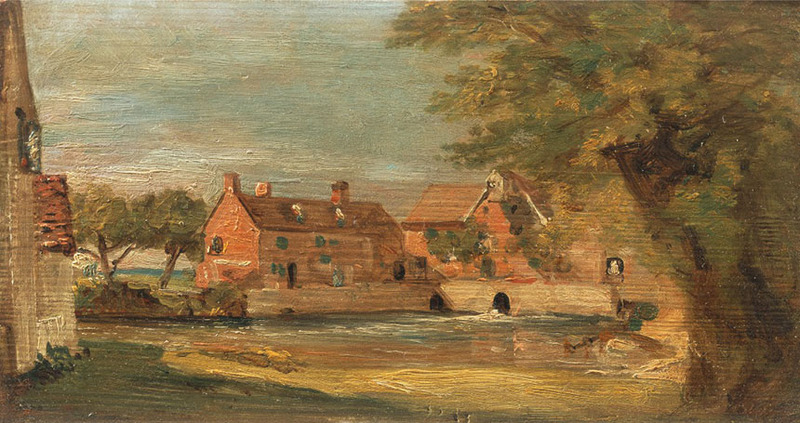 I liked his Water-meadow near Salisbury far more than his Haywain and some of his oil sketches more than both. He was of course influenced as all artists of the period were by Claude Lorraine and there was a fine example there. 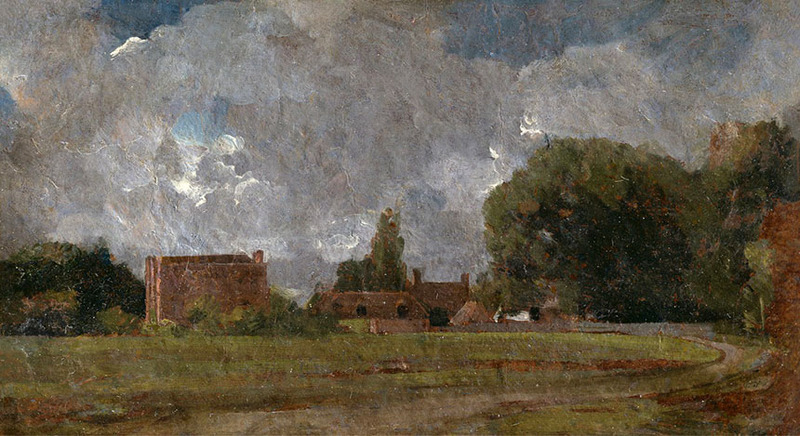 His real contribution was pioneering the working out of doors from life, though the curators of the show didn’t appear to notice that several of the so called plein air sketches had glazing over impasto white which makes it unlikely that they were actually done on site. I will end with my favourite thing from the show. A small oil sketch on a bit of millboard. This is altogether delicious with a light touch and subtle colouring.